Check out this great documentary about animation studio UPA. Parts 2 and 3 after the page break. Some of the world’s best animators have joined Netflix where they’ll create original series. Coming to Amazon Prime on May 11. The Boss Baby: Back in Business is now available on Netflix. Rise of the Teenage Mutant Ninja Turtles premieres September, 2018 on Nickelodeon. Meet Phil LaMarr, one of the most prolific voice actors who’s given voice to over 250 characters. Hulu, Amblin Television and Warner Bros. 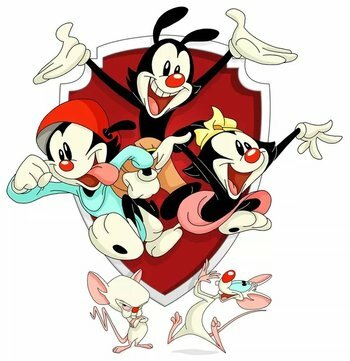 Animation have announced a two-season straight-to-series order for the iconic series Animaniacs. Steven Spielberg will return as executive producer. Pinky and the Brain will also return to make appearances in each episode. New episodes are set to premiere in 2020. In addition to the new series, Hulu also announced that all 99 episodes of the original Animaniacs, as well as Pinky and the Brain, Pinky, Elmyra and the Brain, and Tiny Toon Adventures are now available on the streaming service. Season 4 premieres October 13, 2017 and will consist of 6 episodes.